Estrocomfort is a 100% organic vegetarian menopause management supplement. SoyLife, Black Cohosh extract and Suntheanine are all standardized to contain consistent quantities of beneficial compounds and bring relief from hot flashes and night sweats. SoyLife – Contains isoflavones, which have properties similar to human estrogen, and helps reduce hot flashes and night sweats. Black Cohosh extract – Helps curb symptoms of menopause like hot flashes, irritability, mood swings, insomnia, night sweats, etc. Suntheanine: L- Theanine – Helps relax the body and mind, reduces stress. Vitamin B6 (Pyridoxine hydrochloride), Folic acid, Vitamin B12 (Methylcobalamin) – Essential vitamins required for proper body function and cardiovascular health. Red clover blossom extract – Contains isoflavones which acts like an estrogen substitute and helps manage menopause. Date fruit extract – Induces calm and relaxes the mind. Futurebiotics BioAccelerators™: Bioperine®, Ginger root extract, Trikatu, Digezyme®, Lactospore® – Help the body in the assimilation and absorption of essential nutrients and intensify the effectiveness of supplements. Adults should ideally take 2 capsules a day – one with breakfast and one with dinner. This product contains soy and may cause allergies in some people. L-Theanine is also known to have negative interactions with some drugs and a doctor should be consulted before using this supplement. The listed retail price per bottle is $20.16, but it is available on third party websites like Amazon for $12.72. Each bottle contains a 28 day supply. The supplement is guaranteed organic but there is no guarantee or refund policy in place to assure customers of product effectiveness or quality. Is Futurebiotics Estrocomfort Worth It? This is a good product containing several ingredients that have been found to be effective in reducing the symptoms of menopause and to offer relief to women. It is attractively priced and is much cheaper than other popular menopause supplements. 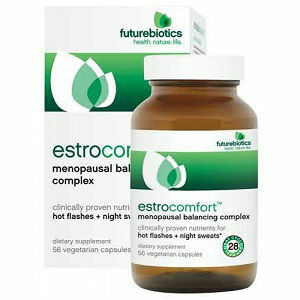 Jackie Horowitz	reviewed Futurebiotics Estrocomfort	on December 31st	 and gave it a rating of 3.